Published by Elite Books, Santa Rosa, CA. Written by a health care practitioner from the vantage point of a patient, veteran homeopath and popular newspaper columnist, Katina Makris, shares her own ten-year healing journey from misdiagnosed Lyme disease. A touching and captivating story, laced with a poetic entwinement to nature, “Out of the Woods” illuminates the interior suffering tens of thousands afﬂicted with epidemic Lyme experience, while offering inspirational hope for recovery. Guidance on vital laboratory testing and treatment options is included. This breathtaking book unfurls a powerful conduit to inner healing, an invaluable tool for any other serious illness. Come take an unparalleled ﬂight of discovery! 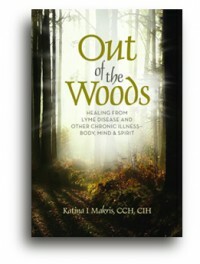 “Out of The Woods” is an award ﬁnalist with USA BOOK NEWS BEST BOOKS 2011. Lonny J. Brown, PhD. is a Holistic Health Counselor, and the author of “Enlightenment In Our Time”. Katina I. Makris, CCH, CIH has worked in natural health care for 27 years, as a Classical Homeopath and Intuitive Healer. She is a former popular newspaper health columnist and a past board member of The Council for Homeopathic Certiﬁcation. Katina is a dynamic, well loved Natural Health care educator and public speaker, currently on a nationwide book tour, lecturing to promote Lyme disease awareness and support. She is a graduate of Duke University and The Stillpoint School of Integrative Life Healing.